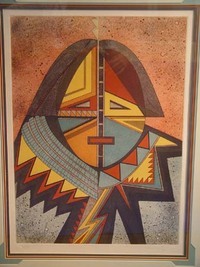 Helen Hardin 1943-1984, whose Indian name was Tsa-Sah-Wee-Eh, Little Standing Spruce, was from the Santa Clara Pueblo in New Mexico and was perhaps one of the most fascinating, complex, and engaging figures in the American Indian art world in the twentieth century. Her art was one of definitive struggle; to capture, hold, and relish those aspects of her native heritage and yet depart from the Santa Fe/Dorothy Dunn School of her predecessors, including her mother Pablita Velarde (b. 1918). Helen Hardin's style, so distinctive and compelling for some viewers, began to emerge in the 1970s with a series of Katsina figure paintings. Her personal explorations led her into the works of her Woman Series, such as Changing Woman. Her work is concerned with the intellectual and physical struggle of her very existence, the struggle of woman versus man, patron versus artist, Indian versus Anglo, tradition versus progression. Complex, it is art that is both forward looking and yet rooted firmly in the ancient past. Helen Hardin’s life was profoundly marked by her search for identity and her struggle for acceptance and recognition both at home and in the world. The art that she created attests to the internal and external conflicts and resolutions that she experienced during her short lifetime. Born on May 29, 1943 to Herbert Hardin, an Anglo policeman, and Pablita Velarde, a renowned Santa Clara artist, Helen was immediately faced with the emotional and cultural challenges of her mixed ethnic background. Rejected by the Santa Clara Pueblo elders as a “half-breed,” Helen was forbidden to partake in the dances and traditions of her mother culture, and was thus unable to create a solid identity for herself as a member of Pueblo society. Living on the outskirts of Tewa culture, Helen found little comfort among her peers and even less comfort in her unstable home environment. Lacking support from her father who left home when she was just thirteen and constantly abused by her emotionally distant mother, Helen yearned for a way to define herself and to become accepted by others. In time, her artistic endeavors would prove to be the medium through which she could put order into her life, and attribute meaning to her existence. Helen never initially aspired to become an artist, and was “in fact negative about the prospect because it would mean competing with her mother” (Scott, 16). In fact, when Helen finally acknowledged her artistic calling, her mother Pablita Velarde was already a prominent Indian artist in the Southwest and did much to prevent her daughter’s arrival onto the art scene. As animosity and jealousy between mother and daughter grew stronger, the challenge for Helen to step out from under her mother’s shadow into a light of her own seemed a formidable one indeed. Yet opportunity came Helen’s way, and in 1962, Helen held her first one-woman show at Coronado Monument, just a few miles north of Albuquerque, New Mexico. Soon thereafter, in 1964, Helen exhibited her works at Enchanted Mesa. However it would not be until 1968, upon her return from a sojourn in Colombia, that Helen would have true confidence in her abilities and a clear vision of her artistic objectives. Having seen the success of her artworks among the Columbian people, far from her mother’s sphere of influence and control, Helen became aware of her full artistic potential. In 1969, Helen won first prize “for innovation” for her Chief’s Robes at the Inter-Tribal Indian Ceremonial in Gallup, New Mexico. In March of 1970, Helen graced the cover of New Mexico Magazine and was featured in the main article entitled “Tsa-Sah-Wee-Eh Does Her Thing”. With this publication, Helen’s status rose overnight to that of a national celebrity. No longer simply the “daughter of Pablita Velarde,” Helen Hardin had become an artist in her own right, and impressed the nation with her inventive and painstakingly perfect compositions. Her fascination with perfectionism demanded a great deal of her time and energy, and at times even “…transcended economic … [and] aesthetic imperatives… her paintings were so full of meticulously executed detail [that] it was impossible for the viewer to appreciate (or even, in some cases, to see) the total complexity of her craftsmanship.” (Scott, 18-19). Yet in using her art as an escape and refuge from her chaotic life, the exactitude that Helen strived for gave her a sense of order and control that she so needed and desired.